Watabe Yūkichi spent twenty days in 1958 with a couple of policemen — Mukōda Tsutomu and his younger sidekick Midorikawa Katsumi — working on a murder investigation. You’ve probably heard the story (here): after some photographs from the series were published in 1958, the series was mostly forgotten in Japan (and Watabe’s work seemed entirely unknown elsewhere) until Parisian publication in 2011 of A criminal investigation. The book went down very well. In retrospect I’m surprised by the coolness of the welcome that I gave to it; I was better disposed to a different collection, 張り込み日記 (Harikomi nikki) = Stakeout diary, in 2013. Both books went out of print and have been reprinted at least once. And now there’s a third collection, confusingly again titled 張り込み日記 (Harikomi nikki). I’ll call it Nikki 2. I can’t think of any precedent for this in the wild, wacky world of photobook publishing. But publishing economics (and copyright issues) aside, let’s look at the book. Here’s its front cover (“Konipan SS”), lying on top of the original Harikomi nikki = Stakeout diary, which I’ll call Diary. Here’s a spread from Nikki 2, on top of the corresponding spread from Diary. A bit more interesting: a spread from Nikki 2, on top of the corresponding spread from Diary, the two of course being from different frames. The book’s publisher is Nanaroku-sha, which shifts large quantities of easy viewing. Nanaroku-sha claims (here) that the book has over 140 photos, and gives conspicuous credit to editorial input from Otsu Ichi, a writer easy reading. It augurs badly. But it works out well. When I look at page after page of material by other photographers that’s primarily praised for its “atmosphere”, I tend to yearn for (in)decisive moments or whatever and get bored; here, not. The more of Watabe’s photos, the more fascinating. The book is compact, the printing (by Sun M Color) is excellent, and even with tax included it’s under three thousand yen. 渡部雄吉 (Watabe Yūkichi). 『張り込み日記』 (Harikomi nikki). Tokyo: ナナロク社 (Nanaroku-sha), 2014. ISBN 978-4-904292-52-5. I can’t find any company whose packing I’d trust that is offering to sell this book to people who don’t happen to (i) be able to read Japanese or (ii) live in Japan. But Japan Exposures does say “if you can’t find what you’re looking for, by all means get in touch”. Approaching the end of another year: it’s the season for photobooks roasting on an open fire, and lots more mutual encouragement to acquire more stuff and make the year’s consumption more conspicuous. I’m tempted to do a world survey, but I haven’t seen enough of what my fellow bloggers prattle about, let alone of the many more books that largely go unmentioned but that sound interesting (example). So I’ll do a _Valerian and look at Japan and not sekai (as the rest of the world is called hereabouts). The lucky cat of the title is the maneki-neko; but fear not, there are only two of these in the book. Both are distinctly old and worn, as is just about everything else depicted in this collection of musty and rusty nooks of Japan, each somehow with its attractions. Plenty of photos of this here at Onaka’s site, here at atsushisaito’s, and here at Josef Chladek’s. Here’s a video flip-through of the book. Onaka Kōji (尾仲浩二). Lucky cat. Matatabi Library. No ISBN. I think “Matatabi Library” means Onaka. (Trivia lovers: matatabi means this.) Anyway, the book is available from the man himself (rather stiff postage charges) as well as booksellers. Adou was a new (Chinese) name to me when I saw a show of his work this year at Zen Foto Gallery (Roppongi). The prints were big and murky (neither of which normally attracts me); S(h)amalada (here) looked bleak, but the photographs were compelling all the same. You can see them on Adou’s site and also here at M97 Gallery (Shanghai). Adou (阿斗). Samalada = 沙馬拉達. Zen Foto Gallery. ISBN 978-4-905453-28-4. The booklet (shown above) from Zen seems to be at least the third major publication of these photos: they have also constituted one volume out of the five of a boxed set, Outward expressions, inward reflections (外象, here); and earlier this year the larger half of a book, Adou & Samalada (阿斗 · 沙马拉达, here). I haven’t seen the former, but the printing in the latter is so different from that in the Zen booklet that somebody (and not only a collector fetishist) might actually want both. If (more sensibly) you want just one, perhaps get the Zen version if you’re in Japan, one of the two Chinese versions if you’re in China, and compare airmail charges etc if you’re elsewhere. Here’s one for you rich people! Yes, over two hundred photos taken by Suda in his early thirties (and thus allowing for at least one volume of very early works). A lot of these appeared in photo magazines at the time. So let’s correct the above: this horribly expensive book is for the middle-income, the rich being able to afford places large enough to house complete runs of 1970s’ Asahi Camera and its rivals. Some is rather “street”, a lot is close to Fūshi kaden . Most is 35mm (or anyway isn’t square). Not every plate is of a five-star photo, but enough are, and the reproduction is excellent. As if there weren’t already enough gimmickry in the wacky world of photobooks, this one comes with a choice of five cover photos. Suda Issei (須田一政). Early works 1970–1975. Akio Nagasawa. No ISBN. The same publisher recently decided that its Fūshi kaden wasn’t expensive enough already, and raised the price by 50%. That might happen with this book too. And here’s the catalogue. The idea seems to have been that of a tolerably good package of decently sized plates, held down to a very palatable price. So many pages are rather cramped, the printing quality is distinctly twentieth-century, and the result would never win any photobook award. Don’t complain, because you get decent reproductions of over two hundred good photos at a keen price. Here’s a video flip-through of the book. Suda Issei (須田一政). Fragments of calm = 凪の片. Tōseisha. ISBN 978-4-88773-145-5. The title means something like “eternal insects” or “insects from the realm of the dead”, and a prefatory note by Hara says he’s heard stories that after death people are transformed into insects. There follow photos incorporating insects, photos of (a non-entomologist human’s idea of) an insect’s view of the human world, photos alluding to birth and to death, photos of models of the human world at a (large) insect’s scale, and more. The religious may make sense of this; I just enjoy the results in my atheistic way. There are plenty of photos of this book here on Josef Chladek’s site and here on atsushisaito’s. Hara Yoshiichi (原芳市). Tokoyo no mushi = 常世の虫. Sōkyūsha. No ISBN. This book is going to puzzle whichever poor librarian is the first to provide Worldcat with a record for it: no publisher is specified, let alone place of publication. Actually it’s published by its creator, who (mostly) lives in Tokyo; so despite its Portuguese ISBN it’s at least as Japanese as it is Portuguese or anything else. It’s a collection of “solitary moments of disconnection” (in the photographer’s words), or perhaps of indecisive moments (not his words). We see individuals thinking, individuals not thinking, scenes likely to start one thinking — yes, it’s free-ranging. There’s even the occasional crowd, though the individual seems in a pocket of space within it. And many pleasing plays of light and shadow. Many photos from the book here; and here’s a video flip-through of the book. Nuno Moreira. State of mind. Self-published. ISBN 978-989-20-4151-3. Available from the man himself. Looking a bit tired, with its dated cover design? Well yes — it’s over thirty years old. And yes, it’s Suda again. The title can be loosely translated as “a hundred views of my Tokyo”. More square B/W, from shortly after what’s in Fūshi kaden , and similar to that and almost as good. The book shown above is printed well for its time, there are seemingly thousands of copies available, and (other than from the dealers with the slickest websites) these are cheap. And so it makes sense for a new edition to come out. But this is a bit on the pricey side. If I lost my copy of the old one I don’t know which edition I’d replace it with. For those who don’t happen to be in Japan, a copy of the new edition (details below) would be easier to obtain than a reasonably priced copy of the old one. The new edition is a kind of hardback/paperback hybrid. (Unkindly, it’s like a hardback whose front hinge has been neatly sliced through.) It’s shorn of a lot of the (Japanese) text of the first edition, but it has some new text in Japanese and English. And it’s well printed. The plates are (trivially) smaller than those in the original. Although the sequence of plates is different, I think that the same hundred are used in both. Suda Issei (須田一政). Waga Tokyo 100 = わが東京100. Zen Foto Gallery. ISBN 9784905453314 (I think). The price is being held down for some time, whereupon it will jump 25% or so (to about half of the current price of Early works 1970–1975 ). You know the story, or bits of it: For twenty days in 1958 a youngish photographer was allowed to photograph two cops hunting for a suspect in a grisly murder; some of the resulting photographs were published in a magazine in 1958, they were then largely forgotten; somebody bought prints half a century later and turned them into the only non-Japanese book by this “unknown” photographer; the book was much feted outside Japan (and an unusual and expensive import within). Well, here’s a Japanese edition, from prints freshly made by Murakoshi Toshiya; and from a brand new publisher, Roshin Books. It has a larger format than A criminal investigation and contains photos that aren’t in that; and the package doesn’t try so hard to be remarkable but I prefer it. “Landscape” photos are either broken across the gutter or squeezed into half a page; I’d have been happier if they’d been rotated to fill the single page. But a large percentage are “portrait”, and this is a fine book. Plenty of photos of this are here at atsushisaito’s site, and here’s a video flip-through. This book too has front cover variants. All variants of the regular version are sold out (at Roshin, if not necessarily at retailers), but Roshin still has copies of the version that comes with a print. Watabe Yūkichi (渡部雄吉). Stakeout diary = 張り込み日記. Roshin Books. ISBN 978-4-9907230-0-2. The photos here are alarming. They’re obviously of somewhere in Britain. There are many young and middle-aged heads glaring, gasping for breath, or just looking lost; they’re all male, many are shaven, they’re all “white”. Yet there are no flags of Ingerland and so it can’t be the EDL. It’s sport(s), but far from what you might see on the telly. It is instead the Shrovetide football match of Ashbourne (Derbyshire): one of the most physical of Britain’s quaint provincial customs. Just good testosterone-powered fun! Somewhere in the middle of all this, there must be a ball — though since most of the players themselves are just blindly following other players (and trying to infer who’s on which side; there are no uniforms), perhaps there isn’t after all and instead it’s far away. All very exciting, and I hope that Kai follows it up with more revelations of the exotic occident (but pauses before his camera or head collides with a boot). Kai Keijirō (甲斐啓二郎). Shrove Tuesday. Totem Pole Photo Gallery. No ISBN. Available from TPPG if you go there in person. The fourth fascicle of . . . I don’t quite know what, after the third (of Tibet) showed I was wrong to think it was Tokyo. They’re probably not fascicles at all, and should be enjoyed independently. And enjoyable they are. They’re “street”, street portraits, things seen in streets. In the first three photos in vol. 4, an elderly, heavily bejewelled gent fishes change from that relic of the last century, a payphone; a contortionist performs in mufti, no, she’s just a normal girl trying to shake a tiny stone out of her boot; a young transsexual happily displays her new breasts to a friend (out in the street, in daylight). True, there aren’t many more photos, but each is big and well printed. Arimoto Shinya (有元伸也). Ariphoto selection vol. 4. Totem Pole Photo Gallery. No ISBN. Available from TPPG if you go there in person, or from the man himself over the interweb. Or from PH, which still seems to have copies of vol. 3 (out of stock elsewhere). No blurring or other Provoke -ative devices here; instead, it’s a 6×7 or 6×9 and flashgun used fluently in Weegee/Moriyama territory, delivering more immediacy and happy surprises than most photographers can manage outdoors in daylight. The most Weegee-like photos are gruesome but the others are among the most enjoyable photos anywhere. Plenty of photos of this here at atsushisaito’s blog. Kurata Seiji (倉田精二). Flash up. Zen Foto Gallery. No ISBN. Watanave Kazuki, Hito . The title means “people” (or “person”), and the book follows pigs from happy life to merchandise: in colour, with all that this entails. It’s neither sensationalist nor sparing, and comes with thoughtful afterwords (in English as well as Japanese) by two of the men whose work is depicted. Here it is at atsushisaito’s blog. An admirable book, one I’d recommend for any library, but (sorry) not one I’d often want to look at, and so space constraints rule it out. Kōriyama Sōichirō, Fukushima . Straight but thoughtful documentary photography of the effect (social and only indirectly medical) of radiation in Fukushima. Slim, but well done, informative, excellently printed, and modestly priced. I’m not getting a copy only because I OD’d on similar (if mostly inferior) books last year, and because plenty of libraries here should have it. 郡山総一郎, Fukushima × フクシマ × 福島. 新日本出版社. ISBN 978-4-406-05673-1. I don’t remember Kōriyama’s book as providing English captions, but there are hints here that it does (and that it has an alternative title, Fukushima black rain). Shiga Lieko, Rasen kaigan: Album . The ghost of Nickolas Muray appears to the young Naitō Masatoshi, prods him to watch Eraserhead and gives him some bricks of infrared Ektachrome. Or something like that. This book, which you’ll have read about already, has some fascinating photos (the ash or snow covering the car interior, the glittering disposable plates, etc). I suppose it’s something like a feature film on paper . . . but a feature film fits handily into a DVD (or of course a few square nanometres of a hard drive) whereas this is a considerable slab of dead tree. And while I might flick through the (many) photos of stones, I wouldn’t want to examine them. Also, when I open the book wide to get a good view of the photos across double-page spreads, the spine makes an ominous cracking sound. But yes, the best of it is very good, so I look forward to Shiga’s Greatest hits . Every one of the book(let)s above is published in Tokyo (except perhaps Lucky cat ). Seigensha and (I think) Foil are based in Kyoto, but recently haven’t excited me. Vacuum Press (Osaka) has been quiet, Mole (Hakodate) is either dead or long dormant, and I haven’t noticed anything new like Kojima Ichiro photographs (nominally published in Tokyo but really a production of Aomori). Mostly B/W. This is odd: Most of the new non-Japanese books that interest me are colour. Overwhelmingly by men. Very bizarre, as plenty of the new non-Japanese books that interest me are by women. Mostly by old geezers (if not necessarily old when they took the photos). Really sad, this. I do see some excellent little shows by young photographers. Skewed toward one photographer, Suda. If any septuagenarian Japanese photographer merited a raise in exposure, it was him. I don’t begrudge him it at all. Still, it’s amusing to see the star-making system in action. (And of course I’ve added my unimportant croaks to the chorus.) This year there’ve also been two other books by Suda that I haven’t mentioned above, and in the next few weeks there’ll be Tokyokei and, I believe, one more. Good! But . . . enough for now? Attention Roland Angst: Could you now please (re)discover Nagano Shigeichi? Araki seems to put out a new book every couple of weeks, and I only look into a copy in a bookshop if its cover is both unfamiliar and arresting. Some I didn’t notice at all. Shi-shōsetsu (死小説, perhaps also titled Death novel ) would have been one of these. I normally don’t bother looking at anything by Moriyama unless somebody is particularly enthusiastic about it, but View from the laboratory (実験室からの眺め, on Niépce) looks interesting and I look forward to examining it. Kawauchi’s Ametsuchi seems to have some good material, but I wasn’t much tempted even by a pile of half-price copies (here) of the Japanese edition, in part because this shares the perverse design of the Aperture version. And then there are — I infer from word of Einmal ist keinmal — more books whose existence I haven’t even noticed. Plus my taste is probably defective. If you’re in Japan, you’ll probably already know where to look for books; if you aren’t, duckduckgo for them. If you want new books to be sent out of Japan, aside from tips above there’s Shashasha, Flotsam and Book of Days (none of which I’ve bought from), and Japan Exposures (which I have); if you want used books there’s Mandarake. You’ll find more “best of 2013” lists here. PS (28 Dec): A disproportionate number of the most rewarding among these are by some bloke in Eugene. And among them — well, see for yourself. The anglophone photobookosphere may have been excited about the Watabe collection A criminal investigation (sample), but to me the packaging seemed over the top. And it was expensive. The recent JCII exhibition of Watabe’s sea photographs made me hope that this material would soon appear in a book that would do it justice. And I wondered what other series might lurk in the camera magazines of the 1950s and 60s. First, surprisingly, we have a reinvestigation of that criminal investigation: 張り込み日記 = Stakeout diary, the debut of atsushisaito‘s Roshin books. The book is coming out in September but you can see a little jpeg of one hundred plates from among which seventy will appear in the book. There will be text in English as well as Japanese. Here‘s the regular edition. Each of the hundred prints (by Murakoshi Toshiya) is sold with book and slipcase as a “special edition“. First come, first served for the photograph selection (I bagged no. 19), and the prices for both the regular and the special edition are reasonable too. In this exhibition we’re showing original vintage prints from the series “Alaska Eskimo” (Asahi Sonorama Sensho 20, Asahi Sonorama, 1979) by Watabe Yūkichi, who became much talked about with “Criminal Investigation”. A postcard elaborates slightly. The prints are from the Asahi Sonorama archives, and are for sale. The hours are 13:00 to 20:00. Here‘s a map to the refreshingly solid building that houses this and other small galleries. It’s a bookshop. If you go there, take a look at the book selection, which probably includes items you haven’t seen elsewhere. Don’t miss Mr Morioka’s own book Books on Japan 1931–1972 (日本の対外宣伝グラフ誌), a book that’s all in Japanese but is lavishly illustrated, about books and magazines for the export market. That said, this is sad. Such an archive should instead have been kept together and sold to a library or museum. From 21 January to 3 February both Place M and M2 will be devoted to Kurata Seiji‘s “Trans Asia, again”. And the great man will talk (in Japanese, of course) with Seto Masato there on the evening of 2 February. Numbers are limited, there’s a charge, a reservation is essential, and I expect that details will soon appear here. I picked up my copy of Abe Jun’s Black and white note 2 (黒白ノート2) today, and yes it’s as good as it’s cracked up to be. Though it thrilled the small, photobook-obsessed corner of the blogosphere, the book of Watabe Yūkichi’s series A Criminal Investigation whelmed me. It’s pretty, even elegant; but the printing doesn’t show detail (and doesn’t make up for this in any obvious way), the elastic band is going to age, and it costs a lot. It contains material for perhaps one quarter of some other, excellent book; but I give it three stars out of five. Still, I do like the photos, and atsushisaito tipped me off to a show of the series at the TAP Gallery (map, map), running till 8 July. He was most (politely) persuasive, so Mrs microcord and I went out to see it. As we got out of the train I heard my name called and there was a friend I hadn’t seen for over a decade, together with a handsome young man. After a short chat we emerged. Featureless at first glance, the neighbourhood quickly turned out to have a lot of fascinating corners. The weather was glorious. So I was already in a good mood as we walked in the door. I forgot to count how many photos there were around the small room. Not too many. The small prints — I think what are quaintly called “8 by 10” — are large enough. They’re darker than the reproductions in the book, more detailed, and (something I always like) sometimes from different frames. “Vintage prints” (not exhibited) cost peanuts by DLK Collection’s standards but major moolah by mine. But the prints exhibited were priced so reasonably that I peeled notes from my tight wad. Yes, I bought a print (of a frame that doesn’t appear in the book); here’s an atrocious reproduction. Like many photo galleries, TAP has a shelf of books and so on of particular connection to its regular exhibitors. These shelves are usually of interest (notably signed yet slightly discounted copies of Dodo Shunji’s Ōsaka at Totem Pole). TAP doesn’t disappoint: it has issue number zero of a new photo magazine, Ima. This has a bit too much of an emphasis on names (Ryan McGinley etc) amply hyped elsewhere, but all the same there’s good stuff. At 1500 yen a pop the magazine won’t be cheap, but this is only 60% or so more than the cost of Asahi or Nippon, which don’t offer many good photos these days. (The current Asahi has Bangladesh by Kikai and a good series by Someya Manabu, but little else. A high percentage of the nudes show industrial-strength retouching, but there’s no hint of ironic intent.) It’s a brave or insane publisher that starts a magazine in Japan, where the more interesting new magazines (e.g. Kaze no tabibito) reliably shrivel and die; let’s hope that this Ima lasts long and without becoming just yet another shoppers’ guide. Reading material in the train on the way back home. TAP Gallery obligingly has not one but three postcards for the show. Go to TAP Gallery for your free set of postcards, but buy a print (or three) while you’re there. 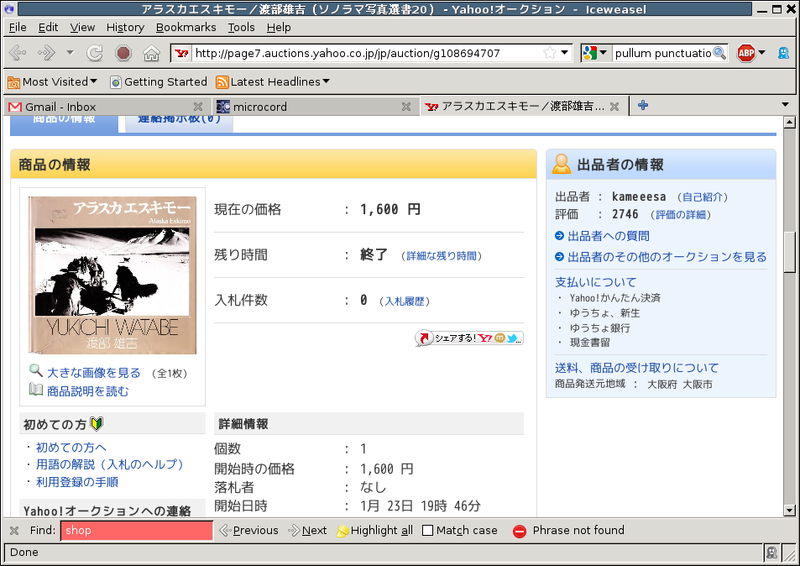 Thanks to all the praise the works of Watabe Yūkichi (such as Alaska Eskimo) have been getting, and my hot tips on where to get Alaska Eskimo cheaply, an auction I pointed to attracted so much interest that this copy of Alaska Eskimo attracted a total of zero (0) bids, ending up unsold at ¥1600. In order that we lazy people don’t have to root around for all the best-of lists and make our own best of the best-ofs, Marc Feustel has considerately done this for us. And his job isn’t over: As stragglers reach the finishing tape of posting their own best-of lists, he’ll update his tallies (or so he promises). I’ve never seen Redheaded Peckerwood, so no comment on that. As for Watabe’s A Criminal Investigation, it’s a lovely package for the book-fondler, but its content hardly competes with what’s in at least two other books by Watabe that now cost far less. Still, if all this excitement results in book publication of excellent work by Watabe that hasn’t yet appeared in any book, then so much the better. More so if the publisher concentrates on what’s important and prices the result accordingly. And of course there are plenty more Japanese photographers whose work is ripe for republication, from the unjustly forgotten (Shimizu Bukō) to the Parr/Badger-celebrated (Kurata Seiji). Perhaps best of all, a big, fat (vulgar Taschen-style) anthology of photo features run by the Japanese photo magazines — Camera, Asahi, Sankei, Mainichi, Nippon, and more — back before their enfeebled survivors nervously shied away from Japanese “street” material: features that were often by photographers whose work would never become well known but that (for me) outclass much of what’s celebrated these days. (Example by Iwaoka Gorō.) Copyright nightmares would probably rule out such a book, and it might be a commercial disaster even if it somehow did emerge (no brand names for the bewildered masses to latch on to; and insufficiently introverted or pretty); but I can dream. . . .